The work of American composer, pianist and bandleader Duke Ellington will be placed under the spotlight at a three-day conference at Birmingham City University's Royal Birmingham Conservatoire, from May 25 till May 27, 2018. The 25th International Duke Ellington Study Group Conference will celebrate the life, music and legacy of the pivotal figure – often credited as the artist who brought jazz in to the mainstream around the world. Alongside themed panels of speakers, including Dr Harvey G Cohen (King's College London) and Dr Katherine Williams (Plymouth University), the event will showcase four concerts by Royal Birmingham Conservatoire's Ellington Orchestra, present numerous small group jam sessions and host the annual general meeting of The Duke Ellington Society UK. Born Edward Kennedy Ellington in April 1899 in Washington DC, he was nicknamed 'Duke' by a boyhood friend, and the moniker stuck. Self-taught at the piano, his influences were wide and varied and, as result, he created works in almost every conceivable medium, including solo songs, orchestral suites, church music and a full-length ballet. Ellington and his orchestra performed all over the world, including extensively in Europe and entertaining audiences in UK cities such as Birmingham, Coventry and Cambridge. The conference has been co-organised by the Jazz Studies research cluster at Birmingham City University, led by Professors Nicholas Gebhardt and Tony Whyton, and Dr Nicolas Pillai. Although only established five years ago, the cluster boasts more than 40 members. These include 10 jazz researchers from across Birmingham School of Media and Royal Birmingham Conservatoire, eight doctoral students and leaders of the regional jazz community, as well as additional academic partners at University of Warwick, University of Amsterdam (Netherlands) and University of Music and the Performing Arts Graz (Austria). Furthermore, the university's new £57 million Royal Birmingham Conservatoire is home to Eastside Jazz Club, the first permanent jazz space in any UK conservatoire. 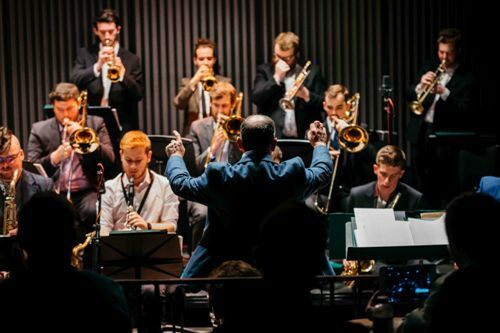 In 2017, the Conservatoire launched its big band Ellington Orchestra (pictured below), who are a regular fixture in the club. Conference co-organiser, Jeremy Price, Head of Jazz and Artistic Director of Eastside Jazz Club, Royal Birmingham Conservatoire, said: "Duke Ellington in many respects set out the blueprint for jazz composition and is still the model band leader to anyone wanting to lead diverse creative talents in their own ensemble. This conference will stand out for integrating abundant live performances, with our Ellington Orchestra doing several shows in our very own Eastside Jazz Club."